The handcrafted heritage quilt that will go to a lucky winner on Saturday, Nov. 14, at Fredonia Heritage Day is displayed by Fredonia Heritage Association members Martha Crozier and Monroe Smith. The quilt was handcrafted by Mrs. Crozier's grandmother in the late 1930s or early 1940s and handed down through generations. Each year's Fredonia Heritage Day carries with it a fundraiser that reflects the festival's message, and this year's offering is getting a lot of attention. It's a handcrafted quilt in a colorful tulip basket block pattern--a work of art not created by any machine. The quilt is believed to have been made in the late 1930s or early 1940s by Martha Crozier's grandmother, Annie Virginia Chatham Ward, in Roanoke. She was born in August 1880 and lived until 1968. In the best Southern tradition, the quilt was handed down and this year donated by the Crozier family of Fredonia. Tickets for an opportunity to win the quilt--$2 each or three for $5--are being offered by members of the Fredonia Heritage Association and are also available at West Point Soap Etc. in West Point, Belcher's Jewelry in Lanett, and Antiques and Uniques in Fredonia. Tickets can also be ordered by calling Martha Crozier at 334-499-2105. 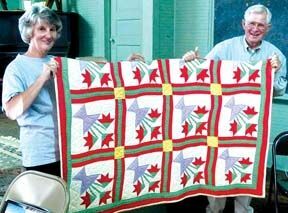 "The quilt has been lovingly cared for through the years, so it's in remarkably good condition," said Mrs. Crozier. "The colors are still very bright and vivid and the backing, which is the original flour-sack backing, is clean and good." She was in elementary school when her father retired from the military and the family moved back to Roanoke. "My grandmother lived with us then, and I have such warm memories of being with her. She loved so much to do needlework, like quilting and crocheting, so I grew up with that." Since king and queen sizes were relatively unheard of back in the time when the quilt was created, the quilt was made for a double bed, but makes a colorful topping folded across any size bed. Serious collectors may prefer to display it in a special frame on a wall. The drawing for the quilt will be at 4 p.m. on Saturday, Nov. 14, at Fredonia Heritage Day. A ticket holder does not have to be present to win. In addition to the quilt drawing, Fredonia Heritage Day will offer a wide range of attractions and entertainment all day. Starting a 10 a.m. Eastern time, there will be continuous on-stage entertainment with some of the leading local and regional performers. There will also be a variety of food available, from traditional festival fare of hot dogs, hamburgers, Polish sausage and funnel cakes to grilled chicken wraps, fried fish and fried green tomatoes. Linda Bolt will be on hand with her famous fried pies. There will be a great opportunity for holiday shopping, with a notable lineup of Southeastern artisans offering unique items, such as seagrass baskets--a popular item last year. Music will range from bluegrass to gospel to Southern rock, with regional favorite Wiregrass bringing a strong bluegrass program. All this takes place inside and on the grounds of historic Fredonia Community House at 6160 Chambers County Road 222, site of the famous Fredonia Bar-B-Que each spring. "This will be the seventh annual Fredonia Heritage Day, and we're delighted to offer this handcrafted quilt, which sends such a colorful and vivid message of our heritage," said Judy Collins, Fredonia Heritage Association President. "We're also very grateful to have the strong lineup of entertainment, demonstrators, presentations, and food that we'll have that day."